One Tuesday night back in 1979, I rushed from my new teaching job at the University of Houston to pick my son Alex up from daycare. He was sitting on a small cot in the crowded daycare, his diaper soggy. He clung to me and cried when I tried to change him, and by the time I got him in the car I was covered in tears, pee and baby snot. When we got home, I gave Alex a bath, crumbled hamburger in a skillet, and started a load of laundry. By the time I got Alex and his big sister Amelia in bed, I was so tired my bones hurt. My 78-year-old Aunt Bee called to see how I was doing. I started out ok, but finally I broke down and started to cry. I was failing my kids and I loved teaching, but I was doing my class preparations after midnight. I was always behind. I told Aunt Bee I was going to quit my job. 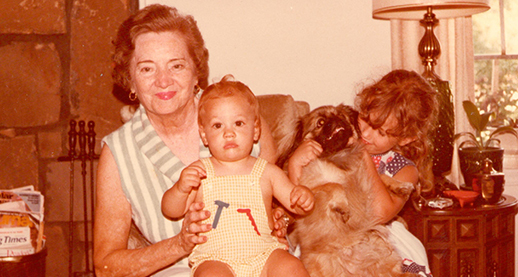 Aunt Bee matter-of-factly told me, “I can’t get there tomorrow, but I can come on Thursday.” She arrived with seven suitcases and a Pekingese named Buddy, and she stayed for 16 years. The reason I’m here today as a United States Senator is because my Aunt Bee rescued me on that Thursday in 1979. I know how lucky I was, because so many working moms don’t have a family member who can rush in and save the day. In fact, the deck has been stacked against working moms for years. And even though women are the main breadwinners, or joint breadwinners, in two-thirds of the families across the country, it’s only getting worse. In one year, more women will file for bankruptcy than graduate from college. Single moms who had been to college are actually 60% more likely to end up bankrupt than their less educated sisters. Women get hit hard. They still earn, on average, only 77 cents to the dollar that her male colleague earns. Bloomberg analyzed census data to find that women are paid less in 264/265 major occupations – in 99.6% of jobs, women get paid less than men. Yet Republicans have blocked the Paycheck Fairness Act – a law that would make sure women don’t get fired just for asking what the guy down the hall makes. Minimum wage workers haven’t gotten a raise in seven years, and today nearly two-thirds of minimum wage workers are women. Mothers of very young children disproportionately work low-wage jobs in every state in the country. A minimum wage job no longer keeps a mother and baby above the poverty line, yet Republicans continue to block legislation to raise the minimum wage. And seniors? Because women make less than men throughout their lifetimes, they receive, on average, more than $4,000 less a year than men in Social Security benefits, yet women rely most heavily on those checks. At a time when Social Security is the only safety net keeping 14 million people out of poverty, Republicans continue to try to cut Social Security for women. I know how lucky I was to have a woman in my life who was there when I needed her. She’s gone now, but the best way I know to honor her memory is to help another woman – or maybe join with a lot of people and help millions of women. It’s time. It’s long past time. Minimum wage. Equal pay. Social Security. Doing something tangible in honor of the women who helped us.